Florida is a strict liability state in terms of dog bites. This means that Florida dog bite liability is placed on the dog’s owner regardless of fault or whether or not the dog was proven to be dangerous before the incident occurred. When filing a dog bite lawsuit, the plaintiff, or injured dog bite victim, is not required to prove that the dog’s owner acted negligently or illegally. However, there are certain exceptions to the strict liability imposed on dog owners. If any of these exceptions apply, the dog’s owner may be protected from legal responsibility for the victim’s injury. Statute 767.04 is Florida’s dog bite statute. The statute states that the dog’s owner is liable for dog bite injuries when the injury occurred in a public place or when the victim was lawfully in a private place. This can also include the owner’s property. Lawful presence on the owner’s property includes when the victim was on the property while performing any legal duties imposed by the state or the federal government. This includes individuals such as post office mail carriers and police officers. Lawful presence also includes individuals who are invited onto the owner’s property in either an openly expressed or implied manner. 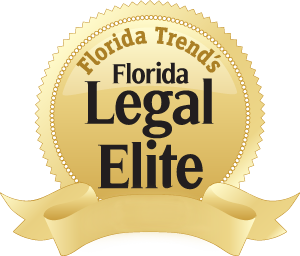 Florida dog bite liability laws state that the owner’s liability may be reduced or eliminated under certain circumstances. The owner may not be liable if the victim provoked the dog to attack through aggravation or voluntarily placing himself or herself in a dangerous or risky situation. Additionally, the owner may avoid liability if a sign is placed on his or her property to warn visitors of the dog’s danger. The victim may be held liable if he or she acted negligently and this negligence contributed to the dog bite injury. The Florida dog bite liability statute states that the victim’s negligence will be evaluated based on the percentage of the role it played in the bite incident. The owner’s liability will then be reduced by this percentage. For example, if it is determined that the victim was half responsible for his or her injuries, the owner may be exempt from paying half of the financial award granted to the victim at the end of the lawsuit. The owner may avoid liability if the dog bite injury occurred on the owner’s property that included a prominent, easy-to-read sign about the dog. The sign must include the words “Bad Dog.” It is important to note that this exception is not applicable in certain cases. The owner may still be liable in cases where he or she acted negligently, or if the dog bite victim is under six years old. 45 Florida Code Sec. 767.04. 2013. Online Sunshine. Web. 9 Jan 2014. <http://www.leg.state.fl.us/statutes/index.cfm?App_mode=Display_Statute&Search_String=&URL=0700-0799/0767/Sections/0767.04.html>. Bonanno, Steven R., Adam P. Karp, and Yvonne C. Ocrant. “Recent developments in animal tort and insurance law.” Tort Trial & Insurance Practice Law Journal Winter 2011: 163+. Academic OneFile. Web. 9 Jan. 2014. Carrns, Ann. “From dogs, a liability bite.” New York Times 26 May 2012: B4(L). Academic OneFile. Web. 9 Jan. 2014. “Prepare for dog bite cases.” Trial Mar. 2013: 56. Academic OneFile. Web. 9 Jan. 2014. Urbina, Ian. “States Try to Weigh Safety With Dog Owners’ Rights.” New York Times 23 July 2007: A12(L). Academic OneFile. Web. 9 Jan. 2014.